A new rapid and inexpensive way to accurately detect the margins between cancer and non-cancerous tissue during breast surgery has been developed by scientists from the RIKEN Cluster for Pioneering Research (CPR), Osaka University, and collaborators. Their system is noteworthy in that it can detect the morphology of the cells, differentiating between cells that are more or less dangerous. 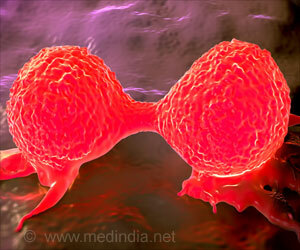 Today, breast-conserving surgery is widely used for the treatment of breast cancer. As a result, finding exactly where a tumor ends and where the healthy tissue begins is an important--but difficult--task for cancer surgeons. Patients hope to keep as much of their healthy breast as possible, but not removing enough can lead to recurrences. At present, the most popular method for finding boundaries is frozen section analysis but it is time-consuming and labor-intensive. For the frozen section analysis, tissues have to be taken and examined during the surgery by a pathologist in a process that can take as long as a half hour. Previously, the group had developed an azide probe that "clicks" to acrolein and then can be made to glow, giving visual clues on the concentration of acrolein in cells. Women working as a border guard could be at a higher risk of developing breast cancer due to their Air pollution exposure, finds a new study.